Actually nobody doubted that ISIL wouldn’t last for long. A terrorist organization soaked in such hatred and violence was doomed to failure from the first day of its inception. So the question here is not how long ISIL will last but what it will have achieved before its final demise. Of course it will take many decades before the people (especially in the Middle East) forget about the havoc ISIL wreaked. 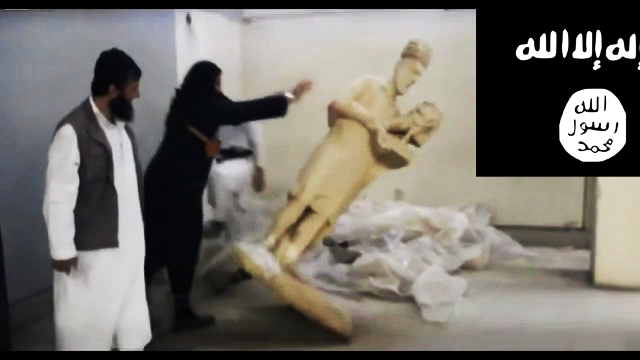 While cold-blooded killing and beheading is going to be the core of their legacy, looting and destruction of the ancient Iraqi artifacts and museums is definitely will be one of their key achievements. Everything will slowly get back to normal long after ISIL has been completely crushed. The land will be liberated, the people will return to their homes and native land. One thing will remain irrevocably destroyed and lost; Iraqi and Syrian ancient heritage and history. The question here; why a purportedly Islamist organization want to destroy ancient Assyrian and Babylonia artifacts. Islamic laws don’t ban sculpture per se (most Islamic countries have museums packed with statues) but only prohibits worshiping idols as used to be during pagan cultures. Everybody knew that neither Assyrian nor Babylonian ancient idols/statues were honored or worshipped by modern day Iraqis or Syrians. Still that did not deter ISIL from destroying the ancient statues, cuneiform tablets and artifacts. By default damaging and looting the ancient Assyrian and Babylonian cuneiform tablets is not on any Jihadist’s agenda, but it seems like a top priority for the hidden collaborators responsible for the very establishment of this terrorist group called ISIL/ISIS. I’m not going to elaborate on how ISIL’s circle of command had been infiltrated from the very beginning by Mossad and how their top leaders were trained (in Jordan and Saudi Arabia) by CIA forces. This has been common knowledge for quite some time now, a premise that is gaining evermore authority by the fact that all of Israel’s Arab neighbors are targeted by ISIL, while the Zionist state remains out of Mujahideen’s range and rage. Israel is waging asymmetric warfare on her Arab neighbors under the false flag operations carried out by their agents in ISIL. The Israeli gains after almost a decade of ISIL propagation and activity are remarkably evident. The Iraqi and Syrian armies (long regarded as a threat to Israel) have been destroyed after the two big Arab countries turned into failed states. The likelihood of those two armies regaining their organization and power is very slim. That’s an obvious achievement for ISIL. But how on earth destroying ancient Assyrian and Babylonian artifacts and cuneiform tablets would benefit Israel? To answer this question we have to go back in time more than 2500 years and exactly to the six century BC. We won’t have to change the location where ISIL is currently established, but we’ll only revisit the place (ancient Arabia and Iraq) in ancient times. As reveled in my book ‘Egypt knew no Pharaohs nor Israelites’ the origin land of Judaism and the Israelite tribe was – contrary to what most believed – in ancient Arabia and North Yemen and not in Palestine. Actually, one of the most amusing scenes is when a western diplomat is photographed wearing Kippah while sucking up to a congregation of Zionist masters. He looks weird because the Jewish Kippah doesn’t fit into the western style and culture and neither should the Israelite stories. The point of origin should not make any difference had the theology been universal in nature (like Buddhism) but the fact is that Judaism is nothing but one of ancient Arabia’s tribal cults. So Judaism was not meant, by the wildest stretch of tribal imagination, to spread one inch beyond the tribal boundaries of ancient Arabia. In the book documents from renowned classical Arabic geographers depicting a whole Arabic landscape in South Arabia and North Yemen founded on the place names the Bible generously offer as a Biblical road map. A body of high profile anthropologists and historians trace the Israelite tribe back to their Arabian origin in Northen Yemen. One of their amazing evidence-based findings is that Jerusalem is originally called Dar Salam/ safe house that is located near mountain Zion in Northern Yemen. There is no Mountain Zion in the whole of Palestine, is there? (the one in Palestine/Israel referred to as Zion is hardly a hill, for crying out loud. Obviously the Rabbis from the temple mount Institute are gravely myopic. The ancient Caravan Road cut across ancient Arabia, from North Yemen in the south to Petra and Egypt in the North. And it flourished from 9th century BC to the 2nd century AD, that’s when it began to lose its strategic value. 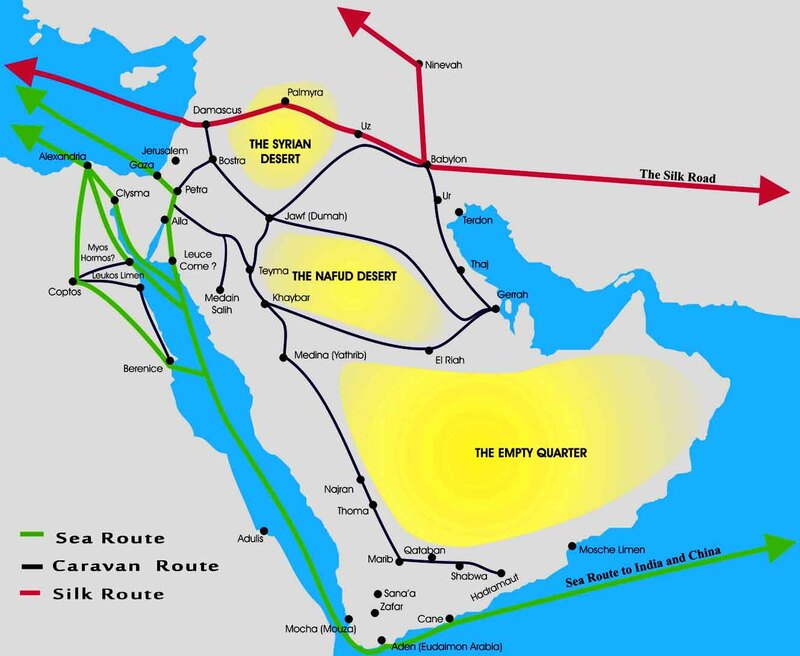 Poor Arabian economic conditions and a growing direct naval route between India and the Mediterranean heralded the end of Caravan route. That ancient and valuable Caravan Road needed protection. Besides, the endless camel caravans that travelled for weeks and months across the Arabian Peninsula had to be supplied with necessary provisions. This is where role of the Arabian tribes came into play. The tribes located along the southern and western coast of ancient Arabia often did that catering and protection. In return they benefited from the trade exchange besides charging the caravan merchants for food, water and other supplies. Since the ancient Caravan Trade had been of strategic value to both the Egyptian Kingdom in the west and the Assyrian and the Babylonian kingdoms in the East they had to control ancient Arabia. Most of the Egyptian and Assyrian military campaigns were targeted at western and southern Arabia. The goal of those campaigns was to secure the Caravan route. It was customary for the Egyptians after they have completed their military campaign in ancient Arabia to assign one of the tribe leaders as their vassal/representative. Many tribe heads acted as vassals for ancient Egypt along the ancient caravan route. The mission of the vassal chiefdom, which kept a minor Egyptian garrison, was to secure the Caravan route and keep Egypt posted on any Arabian rebellion. But the Assyrians and Babylonians had different ways. They usually resorted to blunt force to crush any rebellion amongst the Arabian tribes. Whenever their caravans were threatened or looted it meant one thing, another Assyrian raid is underway. Nine raids, not one of them mentioned Palestine as their destination. Whereas the records clearly mentioned locations in Southern Arabia and North Yemen. We have for example; a raid led by Assyrian king Tiglath-Pileser III 729 – 727 BC, and later on another military campaign conducted by the Assyrian king Sharrukin II (Sargon II) 710 – 705 BC. But after the frequent military campaigns proved ineffective at securing the caravan trade for long period of time, it was time for a different deterring mechanism. As the Babylonians came to power, they decided not to follow the footsteps of the Egyptians and Assyrians. They knew already that limited military campaigns wouldn’t prevent the rebellious Arabian tribes from attacking the Caravan trade. To safeguard the Babylonian interests, Nebuchadnezzar 605 – 562 BC, the Chaldean king in the Neo-Babylonian Empire decided to change course. Instead of just crushing the Arabian tribes for their frequent rebellion, which proved inefficient, he saw the answer to recurrent Arabian headache was mass transfer. Nebuchadnezzar shortly after his ascension to power, unleashed one of the biggest military raids in the history of ancient Arabia. The raid’s target was crushing the Arabian rebellion and transferring/deporting all the tribes involved in attacking the caravan route to Babylonian-controlled territories. 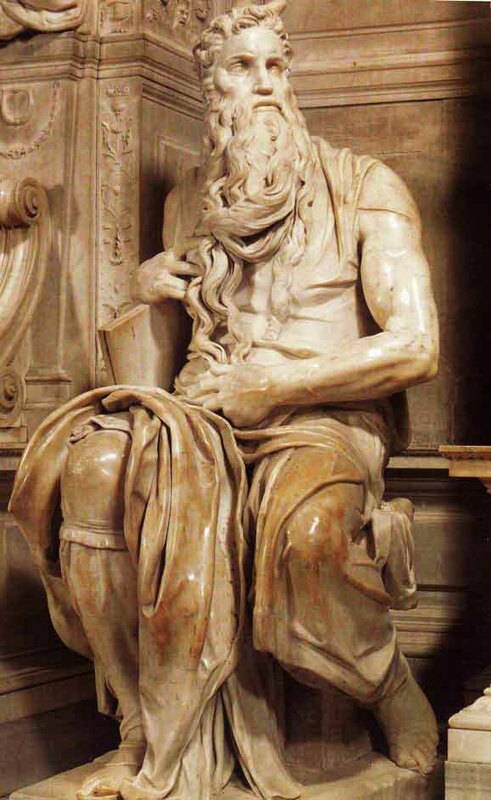 But the obscurantist Israelites saw Nebuchadnezzar’s devastating campaign as a divine punishment; for they had forsaken Yahweh and killed many of his prophets. After the siege and the capture all the Arabian tribes (including the Istraelites) were deported en masse to Babylon where they were kept there till 539 BC. After the fall of Babylon to the Persian king Cyrus the Great in 539 BCE, all exiled Arabian tribes (and not only the Israelites) were granted a pardon and were free to return to their homeland in west and south ancient Arabia. Once again we need to pause here for a while for this point needs to be reiterated. The Nebuchadnezzar military raids were targeted against all Arabian tribes who needed to be punished for their frequent attacking and plundering the Caravan trade. In other words, Nebuchadnezzar did not set out to exclusively attack the Israelites, besiege their DarSalam (Jerusalem), kill their chieftain/king (Jehoiakim) and destroy their temple; rather he waged an outright war against all Arabs in southern and western regions of the Peninsula. The Israelites were captivated (as lawbreakers) for their continuous piracy and plundering not because of their faith, their city and temple destroyed (as collateral damage) in a Babylonian raid aimed at crushing Arabs’ rebellion. But the truth is Nebuchadnezzar might have never heard of the Israelites or their cult before he embarked on his military raids. The Israelite tribe was indeed not the biggest nor the most connected tribe in ancient Arabia. As a matter of fact the Adnan tribe of western Arabia was the key adversary to reckon with in Nebuchadnezzar’s raid. The point we are trying to clarify is that the Israelites were dragged, from North Yemen not Palestine, along many other tribes to Babylon in captivity for their rebellion and plundering. And guess what, Nebuchadnezzar’s plan worked. 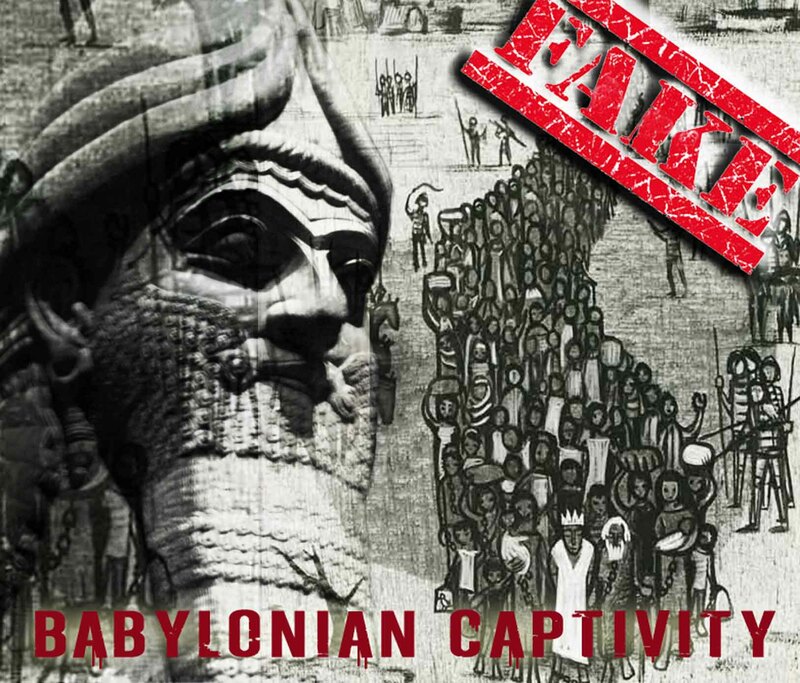 But on the other hand the captivity in Babylon has given the Israelites the golden opportunity to discover a wealth of Sumerian and Babylonian culture and mythology. Feeling the inferiority of their cult, the Israelite scribes embarked on writing down a new book for their tribe. So what we’re looking at here is the Israelite/Jewish distorted version of the ancient Near Eastern history. In the phony version; the Israelites were prosecuted by Egyptian king (so called Pharaoh- another fraud) and attacked by Babylonian king and held in captivity for their faith. But the truth is that the Israelites never set foot in Egypt and that their Captivity in Babylon was part of a bigger exile of Arabian tribes. Also, the Israelite book, kept on distorting the ancient history of Babylon and Assyria where they monopolized the Nebuchadnezzar’s raids and deportation of Arabs. The Captivity of most of Arabian tribes had been twisted into the Exclusive Captivity of the Israelites. The same deception was carried out again when the modern Zionists distorted the history of the World War II. They turned/distorted the war that swept across the whole of Europe, Russia, North Africa and the Far East into an exclusive war against the Jews. The heavy toll of that devastating war (over 60 million were killed) was twisted and somehow monopolized by the Zionist Propaganda machine as the Jewish exclusive calamity. This is how history (ancient and modern) is being distorted by the Israelites and the Zionists. We are living a big lie that was invented by the ancient Israelites, and passed down to us, generation after generation, in their distorted book and stories. Back to ISIL and their destruction of the Assyrian and Babylonian Cuneiform tablets. The Zionists know damn well that the truth about their Yemenite origin could be revealed if more Babylonian Cuneiform tablets are unearthed. Already there is a new archeological and anthropological trend that doubts the mainstream narrative about the origin of the Israelites and questions the Biblical/Zionist interpretation of the Babylonian/Assyrian Cuneiform tablets. The Zionist (Khazarian) Mafia is keen not to let more incriminating evidence fall in the hands of those obviously audacious and impartial scholars. ISIL has done so well so far. 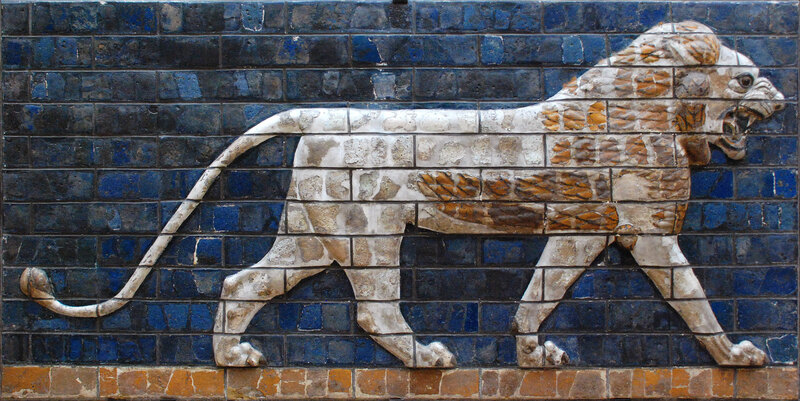 Facilitated by Mossad, hundreds of Babylonian and Assyrian Artifacts have been smuggled out of Iraq and Syria. Months later many of them resurfaced again in Tel Aviv and put on display at the Bible Lands Museum under the title ‘By the Rivers of Babylon’. This is the twisted narrative of the Israelites/Zionists. Anybody who would dare mess with that premise/narrative is crossing the Zionist red line. But red lines should sometimes be crossed in order for the truth to be revealed. For the truth will set us all free. Previous Previous post: What a Great Free Human Being!